This set of Chemical Process Calculation Questions for entrance exams focuses on “Limiting and Excess Reactant-II”. Explanation: All reactants other than limiting reactant are called excess reactant. 2. ___________ reactant in a chemical reaction is that would theoretically run out first if the reaction were to proceed to completion according to the chemical equation , even if the reaction did not take place. Explanation: Limiting reactant in a chemical reaction is that would theoretically run out first if the reaction were to proceed to completion according to the chemical equation , even if the reaction did not take place. 3. The reactant with the smallest maximum extent of reaction is the ___________ reactant. Explanation: The reactant with the smallest maximum extent of reaction is the limiting reactant. 4. Which one is the limiting reactant? Explanation: The required moles of O2 is lesser with respect to CH4. 5. Which one is the excess reactant? Explanation: The required moles of CH4 is greater with respect to O2. 6. How many moles of Al will react with 2.46 mole CuCl2 according to the reaction? Explanation: 2 moles of Al = 3 moles of CuCl2. 7. If The feed contains 3 moles of each component of the feed, which one is the limiting reactant? Explanation: CuCl2 have less number of moles w.r.t. Al. 8. If the feed contains 5 moles of each component of the feed, which one is the excess reactant? N2 + 3 H2 → 2NH3, The feed contains x moles of N2 and y moles of H2. Explanation: If 3x < y, N2 would consume first. Explanation: If 3x > y, N2 would consume last. 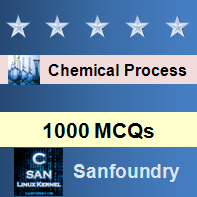 To practice all areas of Chemical Process Calculation for entrance exams, here is complete set of 1000+ Multiple Choice Questions and Answers.